On November 22, 1718, the infamous pirate Blackbeard was killed. Reported to have been a privateer during Queen Anne’s War, Blackbeard is said to have turned to piracy afterward. He is one of the most famous figures associated with the “Golden Age of Piracy,” which flourished briefly along the North Carolina coast in the early 1700s. In 1717, Blackbeard and his fellow pirates captured the French slaveship La Concorde in the eastern Caribbean. With his new ship, which he renamed Queen Anne’s Revenge, Blackbeard cruised the Caribbean taking ships along the way. Arriving off the cost of Charleston, S.C. in May 1718, Blackbeard blockaded the port for nearly a week in what was perhaps the most brazen act of his piratical career. Blackbeard lived in the town of Bath briefly during the summer of 1718, and soon after, attempted to enter what is now Beaufort Inlet with his fleet. The vessels grounded on the ocean floor and were abandoned. Six months later, at Ocracoke Inlet, Blackbeard encountered ships sent by the governor of Virginia, led by Lieutenant Robert Maynard. In a desperate battle, Blackbeard and several of his crew were killed. 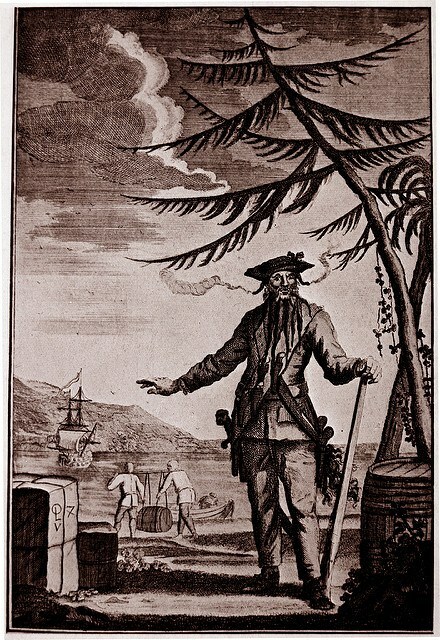 Maynard returned to Virginia with the surviving pirates and the grim trophy of Blackbeard’s severed head.